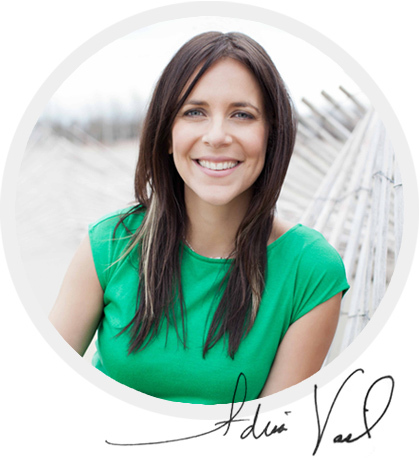 Adria Vasil is a Canadian environmental journalist and the author of the bestselling Ecoholic book series. The former NOW Magazine columnist now writes regularly on sustainable business issues for Corporate Knights magazine, where’s currently the managing digital editor (CK’s print mag is circulated in the Globe & Mail and Washington Post). Adria is also a lecturer with Ryerson University’s School of Journalism. She lives in the east end of Toronto with her spouse and her ridiculously cuddly rescue cat, Ziggy. 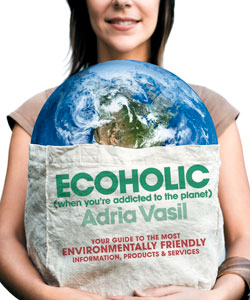 Adria started the Ecoholic column at Toronto’s NOW Magazine (where she was a staff news writer) in early 2004. 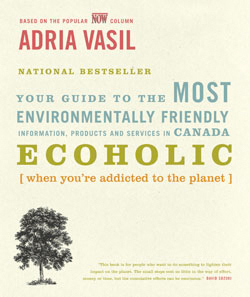 Ecoholic began as a green advice column and later became a mash-up of green news, interviews and brutally honest green product reviews. Soon, Vintage Press/Randomhouse approached Adria about turning her little weekly column into a book and the rest is history. 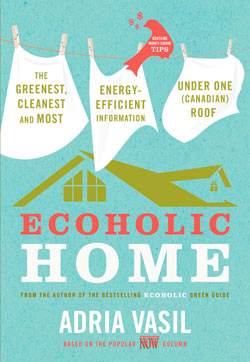 She ended up publishing four books under the Ecoholic banner: Ecoholic (2007), Ecoholic Home (2009), Ecoholic US edition (2009/Norton) and Ecoholic Body (2012). 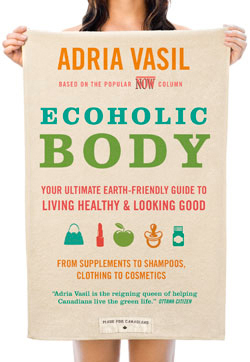 Adria was raised on an organic goat farm by a commune of earth-loving hippies. Wait, sorry, that wasn’t fact-checked properly. The real story is her Greek Canadian dad and French Canadian mom actually moved the family from Montreal, where she was born, to the aluminum-smelting town of Shawinigan to open up not a health store but a, um, McDonald’s (Admittedly, steady access to milkshakes and McNuggets was dreams to a 5-year-old, but it was a fact Adria would later hide in shame from her activist friends.) Giving up the Big Mac life, the family ended moving back to Montreal in the 80s. A lot of bad sh*t was happening to the planet. The Exxon Valdez oil spill, the hole in the ozone layer, acid rain. Watching it all unfold on the nightly news alongside her news junky dad was intense viewing for a teen. How did Adria start doing what she’s doing? After I got my degree in political science from the University of Toronto in the late 90s, I was volunteering then working in the non-profit world researching corporate abuses in developing countries. I was in a planning meeting jamming about how the hell we were going to get the media to write about one of our anti-sweatshop campaigns when it hit me. I was going to go back school to became a journalist to draw attention to the issues I felt were being underreported. So I got a post-graduate degree in journalism from Ryerson University. A year after I graduated, I started the Ecoholic column. Adria’s biggest influence: Definitely my brother Nick. He was my family’s original environmentalist and alternative health guru. When I was a young teen, he started working for Greenpeace Montreal and began bringing home all sorts of flyers and stickers on saving the world, which I promptly plastered everywhere. Nick later developed pretty heavy duty health problems, including a lot of environmental sensitivities. It became clear that he was a canary in the coal mine, picking up on all sorts of pollutants that most of us couldn’t detect. He unplugged as best he could, studying herbalism, holistic nutrition and permaculture. Really, in everything he did, he showed all of us how to live more consciously, more mindfully, more simply. I’m still learning from him, even though he’s not physically around anymore. If he’s here in spirit, he’s probably laughing at the sad state of my garden at the moment. Words of wisdom from Adria’s mom: When I was younger and unsure of whether I could make a difference, my mom told me the world is essentially a giant domino board. “You know, Adria, you can change the world just by working on your little corner of it.” She explained that if we all work on changing our little corners – influencing our friends, our families, our communities – we create a ripple effect that fans out across the country. She was right. I’ve seen it with my own eyes. None of us can change the whole damn planet singlehandedly, but if we all work on our corners of it, watch out. Pet peeves: Antibacterial soap and idling. I mean, really, there is no need.